‘Start with why’ raises the question how can organizations repeatedly attract customers and employees? What is the reason behind companies that over and over disrupt industries by coming up with innovative products? Why do some teams outperform others despite the fact that they have fewer resources available? Simon Sinek’s book claims that the cause of action is to know the reason for why we do the things we do. The example of the Japanese auto plant perfectly describes the underlying thought of the whole book. We are often facing a problem and immediately think about fixing it. This might work for a short period of time, but eventually the same problem will occur again. Only this time the damage done might even be bigger. So instead of fixing the symptoms we need to solve the problem at the core. With an outward focus we are always trying to satisfy others or are driven by external rewards. On an individual level that means we are looking for what another person possess and if we own less, we are unhappy. Or we are driven by money, fame or appreciation from other people. This way we make our own happiness dependent on others. On an organizational level it means that companies are competing against others to stay competitive. To stay competitive organizations need to come up with new products all the time. That is for example why we find 30 different toothpastes in the supermarket, but cannot tell any difference. This focus on competition increases stress for buyer as well as seller. On top, these features can easily be copied by competition because they are simply to observe. Because switching costs for those products are low, customers can easily choose another option without any cost. In order to sell more than competitors organizations use manipulations like price reductions, celebrity endorsement, fear of scarcity or new features. These techniques work. For example, since we humans are a social species, we think if others are using the products they might be good for us as well. When taking the inward orientation we are able to realize the uniqueness every individual or organization possesses. Individuals as well as organizations are able to differentiate based on the beliefs they hold. Many companies have started with only an idea in mind, not a finished product. The products and services offered are simply a result of the beliefs, purpose or cause the founder or group of founders hold. Everything an individual or organization does works to demonstrate their why. This not only reduces stress but creates integrity. Marketing is done on emotions and the need to belong to a bigger cause than oneself. Customers and employees are inspired instead of manipulated. 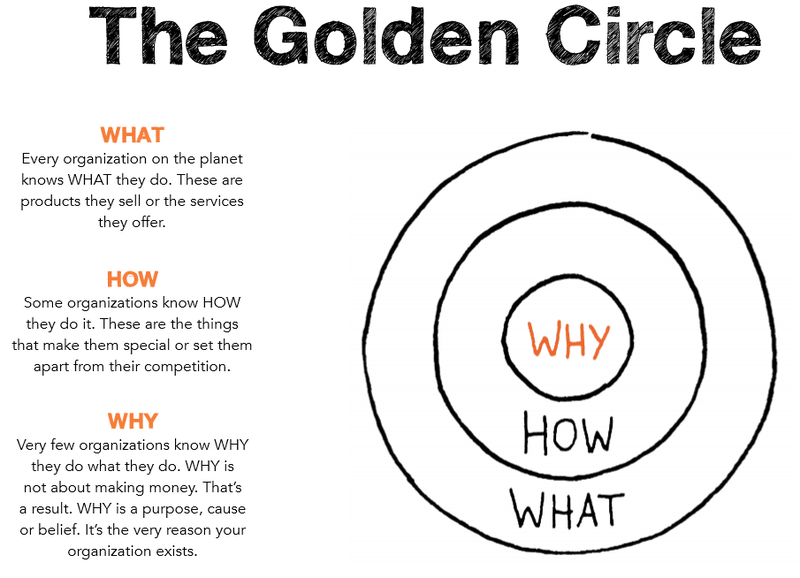 Most companies communicate on WHAT they do; from the outside to the inside of the golden circle. They know exactly what product or service they offer and what features it has. Some organizations might even know HOW they do it. This might be the Unique Selling Proposition (USP). But very few know WHY they do what they do. By starting with why and communicating from the inside out organizations can inspire people to take action. Simon Sinek explains that the golden circle is related to our brain, where the outer part is referring to the neocortex. In this section all the rational and analytical thinking takes place. It is also where language is generated. That is why WHAT is highlighted so much in our communication. The inner circles relate to the limbic brains. This is where emotions and feelings sit. The limbic brains have no capacity for language, but this is where behavior and decision making takes place. This is WHY is tapping into emotions and can inspire people to take action. If we do not know why we do what we do, how will we convince anybody else to take action? How can we create loyal customers and employees? How can we make people believe in what we believe? How can we be integer to ourselves? Knowing why, our core belief or purpose, filters out all the irrelevant things, all the great-looking and well-intended advices. Instead we will only do and adopt what is good for us. Knowing our purpose leads to spending less time on making decisions. We save money because we do not buy all the options available. Most of all we get recognized for a clear belief. Simon Sinek’s why is to inspire people to do what inspires them. He imagines a world where people wake up every day inspired to go to work, feel safe while they are there, and return home at the end of the day feeling fulfilled by the work they do, feeling they have contributed to something greater than themselves. He is doing different things that demonstrate his why. Next to ‘start with why’ he has written another bestseller ‘Leaders eat last’, which explores why some teams pull together and others don’t. His above TED talk from 2009 has more than 27 million views. Simon Sinek inspires individuals and organizations to find their purpose. ‘Start with why’ had a tremendous impact on the creation of HumanBusiness. One could argue that Simon Sinek did his job by inspiring me. What I love the most about his idea is the simplicity of it and that it contradicts our day-to-day behavior. I am really biased when it comes to this book, in a very positive way, so you better check it out yourself.